My name is Joel Godfredson and I, along with my wife Doreen, are the owners of GT Racing. GT Racing started as a way for my father “Hank” to buy a set of race car tires. From there the business grew through the many relationships Hank had in the Porsche racing community. I have been a Porsche enthusiast for most of my life. 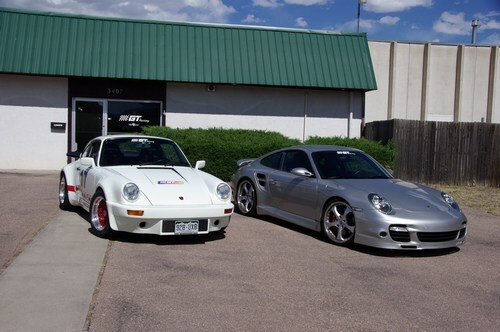 Doreen and I currently own a 2007 997 Turbo and a 1991 964 that has been converted using GT Racing body panels to a 1974 type RSR. We enjoy many Porsche events including Racing, HPDE, tours and social events. Today, GT Racing is still a family run business, all of our parts are made in the USA, we ship all over the world and we have been serving the Porsche community for over 30 years. We are committed to carry on the tradition of providing great quality Porsche parts for lightweight race and street cars. As I have learned over the years, the best way to realize all of the potential of your car including horsepower, handling and braking is to reduce weight. The other great benefit of using GT Racing parts is to make your car stand out from the crowd and make it your own! Our store is organized by model. Check out our model sections to guide you in selecting the correct part for your particular application. We pride ourselves on our customer service. If you have an order or a question, please feel free to call us at (719) 667-0343 or toll free at (800) 797-2911. We are available Monday through Friday 8:00 AM to 5:00 PM MST. Most afternoons we will be at the shop boxing and shipping product so if we don’t answer, please leave a message. Welcome to European Racing Headers! European Racing Headers has had an outstanding reputation of crafting performance Porsche header and exhaust systems for over 42 years! The team at European Racing Headers is committed to continue the legacy of “George” by manufacturing the same or better quality header and exhaust systems that European Racing Headers customers have come to expect by utilizing high quality materials, mandrel bent tubing, Mig and Tig welding as well as many other specialty manufacturing methods. Good car building to you!! !